The play Keisei Hangon Kō was composed by Chikamatsu Monzaemon and was first performed as a puppet play in 1708. Matahei suffers from a terrible stutter and for that reason he is unable to acquire a new name from his teacher, Tosa Mitsunobu, aka Tosa Shogen. On the other hand, Matahei's wife, Otoku, is a great talker and this role has made her one of the three great wife roles in the kabuki theater. Below is information taken directly from naritaya.jp, the official home site of the current Ichikawa Danjūrō. 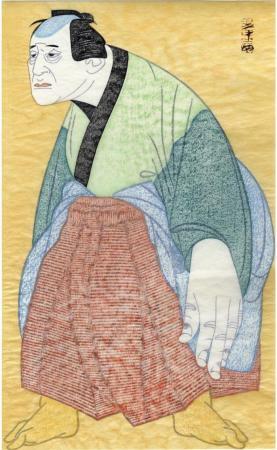 Matahei is an impoverished artist who is one of the disciples of the former court artist Tosa Mitsunobu, or Tosa Shogen. He is hoping to receive a Tosa professional name from his master but his request has been refused. He comes again with his wife Otoku to meet his master. Meanwhile, a group of peasants come to Shogen's villa armed with bamboo spears, saying that there is a tiger loose in the area. Obviously there are no tigers in Japan, and Shogen refuses to believe them. However, they find a tiger in a nearby bamboo grove. Shogen inspects it carefully and announces that it is not an ordinary tiger, but the product of an artist of the Tosa School. Actually, the tiger has been painted by Tosa Motonobu, who has been accused by his rival of plotting against the house which he was serving. He had painted a tiger with his own blood, and the painting was such a masterpiece that the tiger came to life and walked out of the picture to help Motonobu and his lover Ichinomae to make their escape from their enemies. Unaware of Motonobu's circumstances, Shogen orders his young disciple, Shurinosuke to "erase" the tiger with his brush. Shurinosuke succeeds and the tiger disappears. Shogen awards him the name of Tosa Mitsuzumi. Matahei is chagrined at the younger disciple but his master insists that Shurinosuke has proven his ability as an artist while Matahei has yet to do so. A young artist of the Kano school named Utanosuke comes running in to inform Shogen that Motonobu and Ichinomae have escaped from the master's mansion, and are in need of help. Utanosuke himself will hurry to Motonobu's aid, but he asks Shogen to send someone else to rescue Ichinomae. Shogen orders Shurinosuke to go and Matahei is forced to bear the humiliation of seeing the younger disciple being favoured yet again. He begs Shurinosuke to allow him to go but Shogen forces him to give up the idea. Matahei and his wife realize that there is no chance of him being granted the Tosa name. Otoku tells her husband that there is no choice left for them but death. She is willing to accompany him to the other world, but before they take their lives, she wants him to draw a picture of himself on the side of a stone water basin in the garden as a memorial. As Matahei begins to draw on the side of the water basin, the strokes of his brush begin to penetrate through the stone to the other side. When they notice that his drawing has appeared on the opposite side of the basin they are struck dumb with amazement. Shogen has been observing this from inside the house and comes out to praise Matahei for his accomplishment. This feat was the result of Matahei's artistic passion and so, as a reward, he confers on him the name of Tosa Mitsuoki. Having been finally recognized as a Tosa artist, Shogen dispatches Matahei to rescue Ichinomae. Matahei changes into a formal costume more suited to his new name and, first performing a dance of joy, rushes off on his mission. An interesting note is found in the parsing of the plays title. A keisei is a courtesan or prostitute and a honganko is the "incense which supposedly allows the spirit of a departed loved one to be seen in the smoke".